Updated: Wipro’s(s wit) latest IT foray — a global infrastructure as a service for enterprises — shows how the giant Indian outsourcers are striving to become more strategic cloud partners for their business clients and compete hard for cloud outsourcing money with rivals IBM(s ibm), CSC(s csc), as well as their in-country competitors. Wipro’s global data center infrastructure and deep expertise managing mission-critical IT systems to deliver compute, storage, recovery, network, security and other services in an automated, consumption-based model. [iStructure services] will be the foundation for … a broad set of infrastructure, application and business process outsourcing solutions in an ‘as-a-service’ model. Wipro is essentially expanding multi-tenant virtual server hosting that it rolled out last year to existing customers across the U.S., Europe and India, said Michael Wilczak, senior vice president of strategy data center services for Wipro Technologies, in a statement. Update: The platform uses VCE V-blocks comprising Cisco(s csco) servers, EMC(s emc) storage and VMware(s vmw) virtualization as well as Wipro’s proprietary portal and CA’s(s ca) Automation Suite for Cloud, a Wipro spokesman said via email. 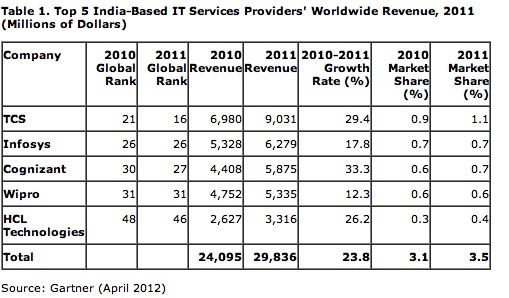 The top Indian IT service providers are on a roll. Recent Gartner(s it) research found that the five biggest players — Tata Consultancy Services, Infosys, Cognizant, Wipro, HCL Technologies, together grew 23.8 percent in 2011 compared to a more down-to-earth 7.7 percent growth rate for the global IT services market as a whole. As enterprise accounts start moving more workloads to cloud services, many will seek out business-focused, rather than public, IaaSes, which still spook some IT shops. Still, hurdles remain. As I reported yesterday, concerns over data sovereignty are keeping multi-national companies from putting much of their data in clouds that straddle national boundaries.